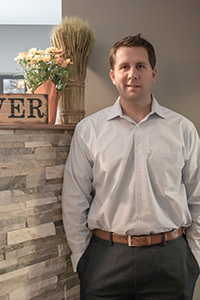 As a teenager, Dr. Chris accompanied his mother on a visit to her chiropractor. This young, enthusiastic health practitioner planted the first seeds of Dr. Chris’ interest in the natural healing profession. While attending the University of Delaware to obtain his undergraduate degree in nutrition, it was time to consider his future career path. Dr. Chris attended Sherman College of Chiropractic in Spartanburg, South Carolina. While there, he joined the Gonstead Club, honing his skills in this form of analysis and chiropractic technique. In 2006, he graduated with a Doctor of Chiropractic. A native of Dover, Dr. Chris and his wife Angie lead active, healthy lives in our community. They love to exercise, follow a vegetarian diet and receive regular chiropractic care. Their young son Casher keeps them busy, and they spend their summers at our beautiful area beaches. Dr. Chris is also the president of the Delaware Chiropractic Society. If you’re wondering what we can do for you, contact us today to schedule a visit with Dr. Chris! He is an in-network insurance provider with most insurances and appointments to accommodate your schedule are generally available.